Mr. Germany has over 37 years of planning and architectural design experience, including residential, commercial, institutional, and recreational design. During his diverse career, Mr. Germany has specialized in the architectural design of a wide variety of multifamily residential projects. Located throughout the United States, these projects have included the design of over 25,000 multifamily residential units in a variety of low-rise, mid-rise and high-rise developments. In addition, Mr. Germany has also participated in the planning and design of several large scale, master planned residential and mixed use communities. A graduate of Auburn University, Mr. Germany is licensed to practice in eleven states and holds an NCARB certificate. Mr. Nonemaker has over 33 years of planning and landscape architectural design experience, including residential, resort, commercial, institutional, and recreational design. The breadth of Mr. Nonemaker’s extensive design and planning experience has been concentrated on the planning and design of multifamily residential communities. These projects have encompassed a variety of development densities, ranging from less than 5 units per acre to over 50 units per acre and are located throughout the United States. In addition, Mr. Nonemaker has also been involved in the planning and design of numerous recreational amenities common to these multifamily developments. A graduate of Purdue University, Mr. Nonemaker is licensed to practice in eight states and holds an CLARB certificate. Mr. Moran has over 30 years of planning and architectural design and production experience, including residential, commercial, medical and recreational design. In recent years, Mr. Moran has been involved in the architectural design of a wide variety of multifamily residential projects. This design experience has included a range of projects, from low-rise garden apartment communities to high density, mid-rise and high-rise buildings. In addition to his residential design experience, Mr. Moran also coordinates the firm’s sustainable design work. 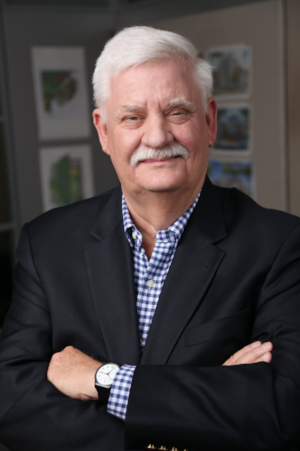 A graduate of the University of Florida and the Georgia Institute of Technology, Mr. Moran is licensed to practice in five states and holds an NCARB certificate.